If a picture is worth a thousand words, how many's a demo worth...? Used by hundreds of facilities world-wide - commercial clubs, universities, YMCAs, private tennis associations, country clubs, communities, resorts… More than 20 million online tennis bookings served! Choose from 3 levels of service - Easily upgrade at any time! Schedules for courts, pros, ball-machines, etc. Includes a 'Bulletin Board' that the club can use to post news, photos, announcements, general information on policies, prices, etc. 'Player Postings' for looking for partners, 'subs', etc. * Minimum annual charge may apply for smaller/seasonal clubs. Significant discount available for 10 or more courts. Create reports on court utilization, pro hours, etc. Players who are more engaged are more satisfied and play more tennis = increased revenue! And best of all, because TennisBookings is completely web-based, all of these benefits are available 24/7 from any computer, tablet or smartphone - anywhere! Most clubs pay less than the cost of a single can of tennis balls per day! We've been serving hundreds of clubs for more than 10 years - with more than 20 million online bookings served worldwide! In our time we've seen many 'competitors' come and go - often leaving their client clubs in the lurch when they fold. If you are tempted to try any such system that promises to be cheaper or even "Free!" please be prepared to "pay" for it with the time and frustration of your staff/administrators and players! Completely Risk-free Setup & 3-Month Satisfaction Guarantee!! Yes, we'll work with you to create a fully customized site for your club, get you online, and provide full support for 3-months of 'live' use before we even think of sending you an invoice. No term contract - cancel at any time. That's how confident we are! "I just wanted to thank you for helping transform the way we reserve our courts here at the Walton Life Fitness Center [Walmart HQ]. As a corporate fitness facility with twenty courts ranging from tennis to squash to wallyball, we have used tennisbookings.com to help us manage the 500 plus court bookings we have per week and our members couldn’t be happier with the system. We use the site to enforce specific rules to our club and now the courts are booked fairly with greater utilization and equal access to all. As a manager, I like having the court reservations being booked by our members rather than the staff as it helps us avoid he said/she said situations (member says they booked a court at one time and we have it written down at a different time). I appreciate being able to “audit” a reservation to see who booked it and at what time. Our members love the ability to see what courts are available 24 hours a day rather than having to call during open hours and book over the phone. The statistics we can generate (how many ball machine hours, lesson hours, team tennis hours, etc.) is also a very useful tool. Support has been very prompt and helpful in accommodating all of our special programming requests including meeting the security requirements that we required to keep our members’ information safe. 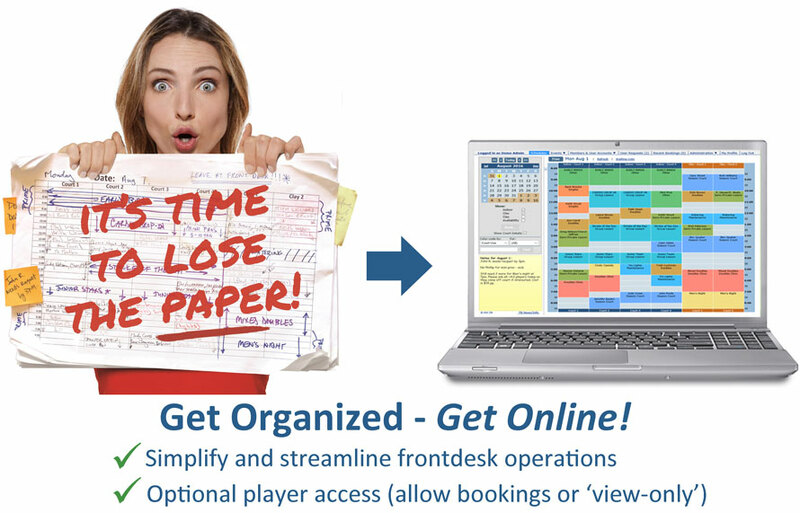 The overwhelming positive feedback we have gotten from our members after just three months of using this online scheduler, reinforces what a great decision it was to switch from our paper reservation system to tennisbookings.com. " "Our tennis website has been up and running for a few months now and the feedback is beyond positive! It is so easy to use and convenient for everyone. I've had literally NO complaints. Thank you." "I just wanted to share with you how very pleased I am with the Court Reservation System, its functionality, its administrative flexibility, user interface, the ease of transition, and superb customer service and support. This week, our first week of being active on the system, has proven we selected the best online court reservation system on the market. Your support over the past 4-6 weeks has been exceptional and has been much appreciated. You have always taking my calls promptly and have responded quickly to all emails. This not only proves to me that you have a quality system but you also take pride in servicing your customers. Thank you again for the tremendous support and very successful system." "We are a small private tennis club that relied on a phone answering system for our court bookings. We paid the booking agency for court reservations, cancellations and inquiries. Faced with increasing costs we began looking at a more accessible and cost effective booking solution. We looked at several systems but ‘Tennisbookings.com’ was by far the best solution for us. Our members love the ability to view court bookings online, making and cancelling bookings is a ‘cinch' and that came from our older members too! The level of technical support provided during the integration into our web site was superb. The system administration is easy to navigate and the usage reports are invaluable to us. Thanks TennisBookings!" "I highly recommend the tennis booking system for any club or public facility. It has streamlined my reservations and increased revenues. My members and instructors love it too! The ability to see court availability and to reserve courts by smart phone, ipad or computer is an easy sale these days. We also love the new membership sign up feature. Since we began our memberships have continuously grown to the point we may have to limit them. I only regret not getting started with tennis bookings 10 years earlier. " 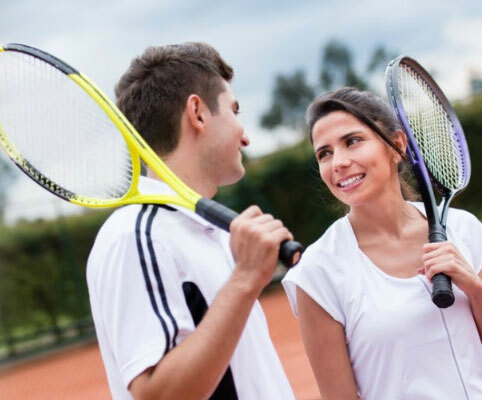 "The YMCA started using tennisbookings.com in 2010 to manage our tennis court reservations, and immediately received rave reviews from the staff and members alike. It has made the entire court booking process more efficient for everyone. It has increased accuracy and eliminated early morning calls to the front desk, calls to check on court availability and scheduling mix-ups caused by the old paper ledger system. We have now expanded its use to include signups for events like socials, practices and USTA matches. A bonus has been the ability to import the Y’s membership database on a weekly basis to more easily track player’s membership and account status. I would highly recommend this program to any facilities looking to manage their tennis court schedules." "As a small, seasonal tennis club we were looking for a simple system to book courts. After assessing 15 potential solutions we selected TennisBookings. It seemed to be just what we were looking for: uncomplicated and geared exactly to our type of club. The best part of our TB experience by far has been the personalized attention. Starting during our evaluation phase and continuing during implementation, I received a timely email or phone response each and every time. In this day of "you figure it out" this was a wonderful change. We ended up implementing TB smoothly over a 2 week period, winning over even the most skeptical members. As hoped, we now cannot imagine living without the system." "I started looking for a court management system for the 2009-10 season, and did look at various alternatives, but found tennisbookings to be significantly more user-friendly and attractive to use. And after using it over the past two years, I am still very happy with it and so are our members, who still compliment us on getting the system. It's both very easy and intuitive to administer, and very easy for our members to use as well. It's very flexible and adaptable to your club's hours and booking rules, and the help desk at tennisbookings is amazingly responsive, courteous and understandable. If there's any problem/request, they basically fix it within 24 hours. You can regularly update and upload your membership list to the site, which makes it very easy for the club stewards to manage the bookings that are still done at the club, and check if a person is a member. It's also cut down significantly on our booking phone-ins, and associated aggravation from misunderstood messages and booking errors and conflicts etc. When members ask the system for an account, it generates an email that you can direct to the person(s) best suited to approve it. That has allowed us to accept them usually on the same day, which means they can start booking almost immediately. You can allow members to choose to publicly show their name on a booking or not, and you can publicly show the court use for each court, from a list of uses you can define yourself - doubles, singles, tournament, maintenance, etc, etc. You can advertise events, although we still use our own website for that. You can run events and allow online sign-ups, specifying number of players, waiting list. There are also many reports which you can generate - who booked what court, who cancelled when, etc. etc. And everything is very easy to find. Sorry I couldn't find something critical to say to perhaps appear more objective, but our experience has just been entirely positive, and the learning curve was very short!" "The Portland Tennis Center and St. Johns Racquet, both facilities operated by Portland Parks and Recreation, began using the tennisbookings system in March 2011 for our 7 indoor courts and 8 outdoor courts. The result has been significant increased court usage, a reduction of more than 80% in our phone calls, convenience for our customers and audit capability. Because of the initial success, we have added more than 20 additional outdoor courts throughout the City. Tech support is within hours, sometimes minutes! Paul is extremely helpful. We have not experienced any major issues nor have our customers. I would highly recommend this system. " "Tennisbookings.com has helped our tennis facility more than double the amount of revenue we brought in our first two years of operations. The ease of setting up programs and processing payments has freed up our management to focus on growing tennis programming versus dealing with labor-intensive paper registration sheets and processing transactions individually. From court and ball-machine rentals to private and group tennis lesson bookings, the system is a true time saver. Our members have enjoyed using the system to register themselves and family members in a simple and practical format. They enjoy the ability to view the court availability without having to call in and try to speak to someone about booking a court. Customer service at tennisbookings.com has been quick to address any issues in a very timely manner. " "Our not for profit tennis club of 600 members is based in Melbourne, Australia. We commissioned the TennisBookings system during March 2012 as a replacement for a manual, paper based court booking system. Since implementing the system, we have received overwhelmingly positive feedback from our members and volunteer staff. Our members find the online system to be very intuitive and simple to use. The system has reduced the workload on our volunteer court administrator and we have observed a discernible rise in court utilisation. In parallel with the introduction of the system, we instigated a number of policy changes which the system is able to enforce (for example, maximum court bookings per member) – we now have a fairer and more equitable means of allocating courts to members. We would recommend the system to those clubs seeking a fully featured, professionally developed system supported by a strongly customer-focussed team"
"It is a pleasure for me to write a testimonial for Tennisbookings, our online reservation system. I highly recommend the system to any tennis facility. I am the Director at the Bobcat Tennis Center in Bozeman, Montana, we have four indoor courts and eight out. Using the Tennisbookings online reservation system has been a huge improvement for our facility on many levels. Most importantly the system allows my front desk staff to easily track membership status to ensure everyone on the court reservation has paid. Our pro staff and I can easily make changes and reserve courts from our phones, I-pads and home computers, so reservations and cancelations are much more accurate now. Scheduling in programs and lessons months ahead is no problem and since our facility is at max capacity in the winter, our reservation system is much smoother and easier for our members. Tennisbookings also makes it much easier for me to track court usage and generate court utilization reports. Paul has set up our system specifically so it works perfectly for the Bobcat Tennis Center. He has been a great pleasure to work with. He always answers the phone when we call with questions and replies immediately when we need help with anything. His system is affordable and he is a true professional! I would highly recommend this system to any facility. " "Tennisbookings is an awesome online program that allows me to run my business efficiently. All of our clients are able to use this program no matter where they are, and it is very user friendly! Tennis bookings has made the difference from our club being an average club to becoming a club with the most advanced online booking system. It is very easy to use as an administrator as well as a client." "We do not operate like most clubs, yet Tennis Bookings has the flexibility to accommodate our needs quite elegantly. Users and Pros book courts as needed and within the structure of availability that we have created. Admins have minimal involvement after the initial configuration. Usage of the admin interface is intuitive and requires practically no training. Usage of the end user interface is likewise simple and requires no training of the club’s members. We derive additional benefit now because we can track court utilization with much greater detail." "The tennisbookings.com team helped our swim and tennis club create a personalized court reservation system which works well for managing our 8 tennis courts and 3 platform tennis courts. Setting up the system was easier than expected, and our members really appreciate the ability to make online reservations 24/7, instead of just during pro shop hours, and hearing about upcoming programs and events each time they log in to book a court. Since implementing the online reservation system, not only have we made it easier for our members to make court reservations, we've seen less conflict among members booking courts during peak demand times and an increase in our guest revenue. Well worth the investment! " "The staff of the BHC found this online reservation system quite user friendly, especially compared to what we were using. Paul at Tennis Bookings took the time to learn about how we did things here at the BHC and modified the program to meet many of our needs, and more. Paul is quite knowledgeable and very accommodating; Paul is on your team and wants his system to meet all your needs. One or two details we found helpful, that were not part of this reservation system, will be! Paul takes interest in your process and is quite willing to update the existing program. The upload to our web site could not have gone more smoothly. Lastly, the membership feedback has been ALL positive. We feel we have a win-win situation. Thank you Tennis Bookings." "Things are going smoothly here at BETC. Thank you for all of your help, patience, support and expertise with the program. Members are liking it, staff loves it, and we seem to be selling more courts. Am looking forward to seeing the court usage data in a month or so. Again, I can't tell you how many positive comments I have gotten at the front desk. Our members LOVE this program. " "TennisBookings.com has not only dramatically reduced our internal court scheduling workload, it has also unequivocally given us a competitive advantage over other clubs in the area. Our members appreciate the ease and convenience of booking their own courts and lessons from home, from work or on the go from their PDA. This saves them time, and thanks to fewer phone calls, frees up our staff for other productive activities. Finally, we have been exceptionally pleased with the level of service and customization offered: the system caters to our business practices and integrates seamlessly with our website. Great job!" "As one of the busiest tennis clubs in the country - boasting 18 courts - the TennisBookings.com system has revolutionized our club’s reservation process. Allowing members to book online has been a great feature, and our court usage has increased because the members have been able to see (and reserve) the available court times. Likewise, our staff are no longer under fire for any reservation errors, since the reservation process is placed in the member’s hands, and designed to be much more error proof. The ability to audit the history of a reservation allows management the ability to hold staff accountable when there is a reservation discrepancy or cancellation, resulting in less errors and better training of staff. Our Club has been able to elevate the level of service at our Sports Desk now that the task of taking reservations has been lifted from these employees. The program is enjoyed by members and staff alike, and a real win- win for Manhattan Country Club! Tennisbookings.com has always provided speedy and prompt customer service and they made our transition online smooth and effortless. We love TennisBookings.com! " "We have been using TennisBookings as our court scheduler for about two years now and are very pleased with the program and the customer service from TennisBookings. The customer service staff has always been very quick to respond. They have also been clear and creative in finding a solution if we have a question or need. Briefly the court scheduling system has: Reduced our labor costs in bookings, cancellations and billing Allowed clients the ability to book/cancel or change court reservations 24/7 Allowed clients the ability to see open courts and fill them Allowed us an easy way to contact all members Allowed us a good way of tracking court usage Overall the program is flexible and easy to use. I have never had a member call me and ask for directions on how to book a court. I can highly recommend TennisBookings." "We have been using tennisbookings.com for the past 6 months and are very happy with its great customer service. They respond to any questions we might have extremely fast. The booking system itself is very easy to use and keeps our tennis reservations very organized. The system keeps track of every little detail which is important to give outstanding service to our Resort guests. We love tennisbookings.com here at The Ritz-Carlton, Grand Cayman!!!" "Since we switched our reservation system to tennisbookings.com, our members have unanimously remarked that it is a tremendous improvement over our previous call-in service. With a few clicks of the mouse, it is a breeze to view available court time and book a court. The site is intuitive and straight forward even when using it for the first time. We have witnessed greater court utilization because of the ease of viewing court availability in real time. Would highly recommend tennisbookings.com to any club." "We implemented the TennisBookings system one year ago and we are more than satisfied with its features. Staff appreciate the real time reservations; members are happy to be able to view court availability without calling in; and both staff and members are pleased with the ease of managing court time. I can schedule an entire season of programs, editing for Holiday dates and special events. We highly recommend this program; it's a perfect fit for our facility." "The Village of Oak Creek Association, in Sedona (AZ), has been using the TennisBookings system for the past year. We have 2 tennis courts and about 50 members. The system replaced a manual sign-up sheet, which had a myriad of problems. The TennisBooking system has been absolutely problem-free. As system administrator, I frequently forget that I have any duties at all. I added a new account from a cruise ship in the Mediterranean, and several times from my i-phone. The system provides true web-based convenience. We support public drop-in play for certain times of the day. The TennisBookings staff actually proposed and implemented several custom features to facilitate this. I have been very impressed with their service. Thank you very much." 5. it takes surprisingly little of my time to administer the system." "TennisBookings has helped bring a new level of organization and structure to our tennis court oversight. In addition to the scheduling system itself, their customer service is top notch, answering any questions we had promptly and thoroughly. 'The tennisbookings system was such a success with our tennis courts that we are now also using it to manage our university squash courts as well." "The Tennis Bookings Reservation site has revolutionized our tennis program is several areas: It enables us to provide far superior service to our members by creating one easily accessible place for pre-approved members to reserve their own court, sign up for any tennis event, and access the latest tennis information through live links much like a website within a website. From the administration side, it has drastically reduced the time needed to pre-reserve courts for lessons, league matches, and special events. It also allows us to have a tangible record keeping source with easy access to member information for billing purposes. The customer service we have received has been excellent and I would recommend the TennisBookings system to any facility looking for a more efficient way to handle the everyday challenges of running a tennis program." "Our tennis club has been using the Tennis Booking court reservation system since May of 2010 and we have found it to be very reliable. The vendor has been very prompt in working with us to customize the system to meet our requirements. Other support service has also been very good. The system has resulted in a cost savings since we now require only minimal admin assistance in taking court reservations. We are also experiencing improved court utilization." "The Tennis Scheduler has made booking courts much simpler for our Front Desk staff. It’s easy to learn and use, even for a non tennis player. We’ve eliminated all the paper we used to use, and Members like being able to go on line to see how the courts are booked. I would recommend it highly to any Tennis Club or Facility." "I have found the TennisBookings system to be the answer to many issues we faced. Tops on the list are: • It provides us witha readily accessible communication system with our members for program schedules and special events; • It is an easy method of equal opportunity for all members to get the reservations they want, and a visual aid to see when other times are available. This has led to a more equal distribution of court times throughout the day and by all club members, not just the ones that used to hit the phone redial button time after time in the mornings... • It has reduced our front desk staffing needs from 2 people during prime times on duty, to only one person during most hours of the day. The time to set up the system and monthly investment has been well worth it! The service and tech support that we have received throughout the process has been remarkably patience for our "special" needs from time to time. Thank you for providing this service." "TennisBookings has been a great addition to our winter tennis experience. Our members can now see what courts are available in our winter bubble and can reserve them on their own without having to make a phone call. This is especially helpful after hours when our clubhouse office is closed. The system is very user friendly and for all that it does I believe it provides exceptional value." (4) allows us to generate an historical record of usage to better predict future demand. Court utilization and member satisfaction is up while our front-desk staffing needs are down. The system more than pays for itself by selling otherwise unused court hours. To me, tennisbookings is a no brainer for any facility"
"Everything is functioning very well with the integration of tennisbookings into the rowayton paddle website. Thank you again for your assistance. In addition to your capable booking system, the technical and systems support is superb. I look forward to working with you on future projects." "We switched to Tennis Bookings online reservation system in March 2010 and couldn’t be happier with the results. The membership has embraced the ease of use and can’t imagine not having this option to book their court times online. It has made reserving a court quick and easy. When we’ve had any questions regarding any of our set-up particulars, Paul has been quick to respond with an answer or solution. We would highly recommend Tennis Bookings to anyone looking for an online booking reservation system. " "We recently made the switch from a phone reservation system to tennisbookings.com. The transition went very smoothly and our members are very happy with the change. I was the interface between our club and tennisbookings during system implementation, and as such brought little to no technical skills in terms of getting such a system up and running. However, Tennisbookings did a nice job of getting me up to speed without undue pain. They were extremely helpful throughout the transition process." "Due to budget constraints, our front-desk is normally staffed for only a few hours a day. This used to mean we were often missing out on revenue-earning court bookings because we had no one available to answer the phone. However, since we went live with the TennisBookings system we can now take bookings 24/7, and this has definitely improved our revenue! The fact that many bookings are now also paid for online further reduces our need for front-desk staffing. The same applies for our annual membership dues – most of these are now paid for online and this has significantly reduced this yearly headache for our staff. The online system is helping to increase revenue and at the same time decreasing our operating costs. I remember one particular weekend when, due to early completion of a college tournament, we suddenly had a lot of available court-time. A quick email blast to our members about the open courts had a terrific response and the courts quickly filled-up with paid-for bookings – even though there was nobody at the front desk! The extra income from this one afternoon more than paid for our use of the online system for many months." "We are delighted with the introduction of the Tennis Bookings court scheduler at our Club Torrey Pines apartment community in San Diego. Previously we had relied on a simple sign-up board at the courts however, this really only provided for a “first come/first served” walk-up basis for court usage and we wanted to do more. By implementing Tennis Bookings’ system we now have an electronic tool whereby our residents can book a court from home, while traveling on business or anywhere they can access the internet. Upon installation and after sending out a memo to our 480 resident units explaining the system, we saw an immediate use of the system for court bookings and received comments from our residents complimenting us on providing this efficient way of reserving a court. We also installed a kiosk at the court center where residents can walk up, see availability and claim a court at that time. Concurrent with adding the court scheduler we provided for one court to be dual striped to allow either traditional tennis or use as a pair of Pickleball courts. While this was a new concept for Tennis Bookings, they quickly understood our objective and provided a modification to their standard system to allow for booking either tennis or Pickleball. The system is great but the support from Tennis Bookings is even better. From our initial inquiry, all the way through planning and implementation, and now as we operate with the system in place we have received immediate and simple-to-understand support from Tennis Bookings. The process could not have been easier to add this excellent component to our racquet center."